How Deep was the Spring Snow? In units of trout size. We had a quick Mexican dinner at Prather, and then headed for Sample Meadows road off of Kaiser Pass so we could sleep at altitude (8800 ft). There was some daylight left when we arrived. 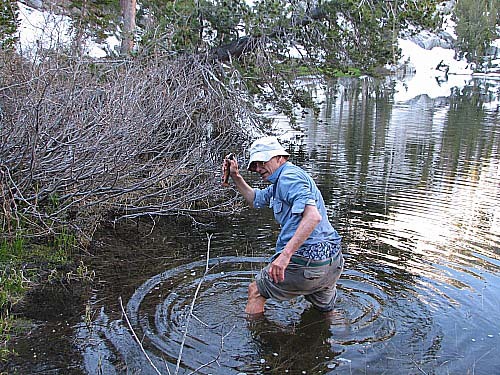 So we went exploring to see how close we could come to an off trail lake that might have brown trout in it. By dark we had reached the end of the logging roads. So we left the lake for another trip. The next morning we got up about dawn. It was in the chilly forty's when we awoke, so we decided to drive to the trailhead. The heater in the car was felt so good, and the picnic tables made breakfast almost civilized. It was there that we met our friends the mosquitoes, who would be with us the rest of the trip. The next morning, we decided to go cross country to another lake. 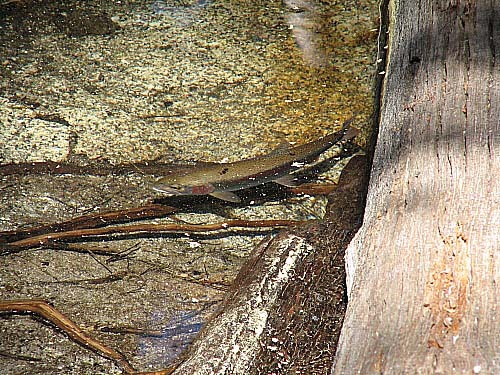 On previous occasions, it was chock full of brook trout. Using our trusty GPS and topo maps it was easy to find. True to form, when we arrived the lake surface was dimpled with many raises. On Tony’s first cast, he hooked a nice nine-inch brookie which promptly got caught in some vegetation. Never let it be said that Tony does not get his fish. Immediately he stripped down and went wadding next to the snow bank. The ice cubes that walked out of the lake were actually his feet. Later he would claim he was just trying to retrieve his favorite fly. There were plenty of hungry brookies and it was difficult to make a cast without getting a strike. In about an hour Tony had his limit. Gary was also catching plenty also but he was pickier about what he would keep. When he worked his way around to the inlet stream where the snow banks were the biggest he called out that this was a good area to practice his casting. At the other areas of the lake he had to spend too much time catching and releasing trout! Some people are just picky! Due to snow melt at the inlet, the water was definitely colder and there was much less insect activity. 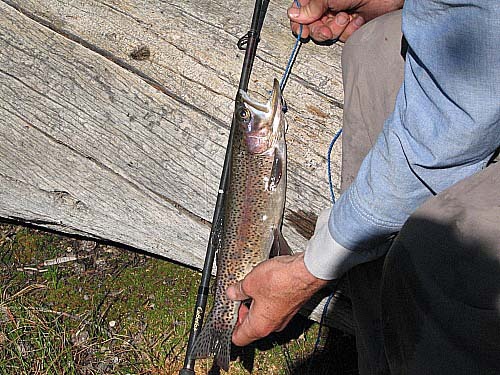 Also Gary observed that the trout on his stringer became dormant in the cold snow melt run off. Catching fish is such hard work that Tony took a short nap on his poncho and then headed back to the campsite after lunch. Gary decided to stay awhile, listening to the quiet roar of the wilderness waking in springtime. 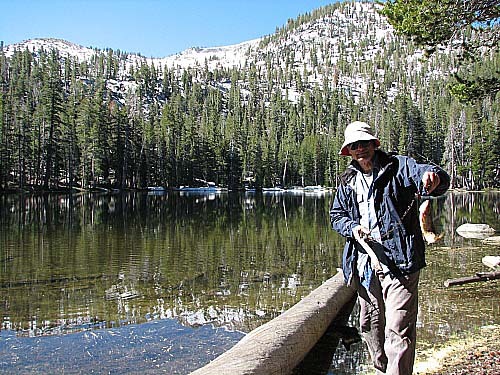 After a few rain sprinkles and exploring a second nearby lake, Gary arrived back at the campsite to find Tony actively engaged in conversation with a nice 14” rainbow. It was the biggest fish of the trip. We again had a marvelous fish dinner topped off by a fresh home grown orange, some cookies and wine. After telling a few stories around a roaring campfire we retreated to our tents. It had been a very good day. The next morning we collected some fish to bring to the coolers in the car. The snow banks on the Kaiser Pass road were still more than 5 feet high. On the way home we stopped at a great Mexican restaurant in Madera. It was on Highway 145, West of Highway 99. It is called Burrito King.